This year, the Chinese New Year falls on a Lunar New Year in the lunisolar Chinese calendar. This is also known as the Spring Festival. This is a time for Chinese families to cleanse their house to sweep away ill fortune and make room for good luck. You will see doors decorated with red colored paper cutouts with themes of "happiness" and "wealth." In 2014, it was the Year of the Horse and 2015 was the year of the Sheep. This year, we celebrate the year of the Monkey! Curious to learn more about the Chinese New Year? Read on! This year, the festivities officially begin on February 7, 2016, which is Chinese New Year's Eve. Families get together for what is considered the most important dinner of the year. All families include fish in their meal, as it is supposed to bring a surplus of wealth! Then on February 8th, it is Chinese New Year’s Day, which is celebrated with family visits and New Year celebrations. The fun festivities include dragon dances, setting off firecrackers, and worshipping ancestors. People also exchange gifts - red packets, or envelopes, filled with money! Chinese New Year is a public holiday for the Chinese people. It typically lasts seven consecutive days from Chinese New Year's Eve to the sixth day after Chinese New Year's Day. This year, it will conclude around Valentine’s Day with people returning to work on February 14th or the 15th. The Chinese traditionally celebrate the beginning of a new year of farm work and wish for a good harvest to come. China's farming cycle is supposed to start soon after this, but it actually depends on the location - the ground doesn't thaw in some places in China until March. However, traditions have changed a little. Today, people celebrate the start of a new business year and wish for profits and success. This Chinese New Year is the year of the Monkey. Each year is different and related to an animal sign in the Chinese zodiac. For people born in a year of the monkey (1920, 1932, 1944, 1956, 1968, 1980, 1992, 2004), your lucky numbers are considered 4 and 9. Those with the sign of the monkey are also supposed to be witty, intelligent and have a magnetic personality. Find out your Chinese zodiac sign here! This year, you can help celebrate Chinese New Year’s with Western Union! If you send a qualifying transfer online or at participating agent locations from select countries and it is picked up between January 4th and February 7th, 2016, Western Union will donate 1 RMB, up to a total of 300,000 RMB, to a charity that helps connect children in China to their parents overseas*. 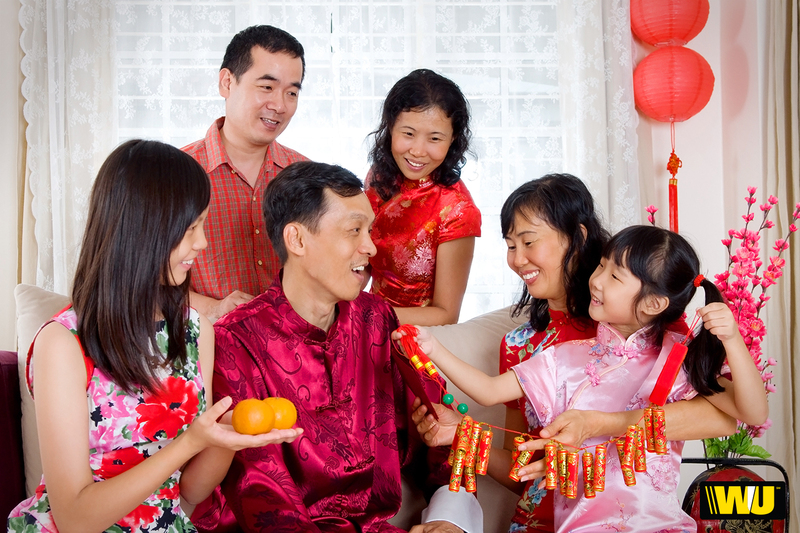 Western Union is all about connecting families with their loved ones, especially during such wonderful holidays like Chinese New Year. Chinese New Year is certainly one of the most loving times of the year. If you are visiting China for this holiday, remember that most small shops, restaurants and businesses close for about 10 days during Chinese New Year. The Chinese New Year is a unique holiday that is widely celebrated across Asia. If you have the opportunity to celebrate this great day in China, take advantage of learning more about their culture! *1 RMB for each consumer to consumer money transfer sent from Australia, Japan, Singapore, US, Canada (except Quebec), the UK, Brazil, the UAE, or Russia to China between January 4, 2016, and February 7, 2016, Western Union will contribute 1 RMB to the Jiangmen Datong Social Work Comprehensive Service Center, up to a total of 300,000 RMB.